Aux Mêmes is a small 3 star campsite of large pitches suitable for tents, caravans and motorhomes most having electricity and water, set on a combination of flat and gently sloping grass within 22 acres of rolling farmland. 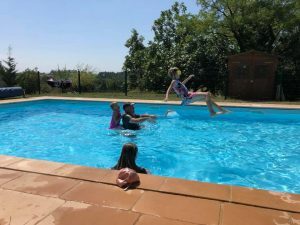 We have superb showers, toilets and wash-basins including facilities for the disabled, laundry/drying room, washing up sinks and shop for essential provisions. There is a terrace cafe/bar serving snacks, evening meals and all day refreshments. 4kms away is the village of Masseube with local shops, supermarket, restaurants and banks. 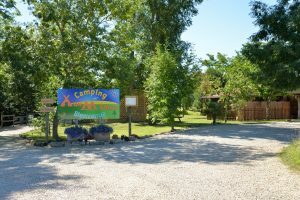 We are proud to be included in and inspected by the “Cool Camping” guide to the top 100 campsites in France, the Dutch ANWB Kleine Campings Guide, the Dutch ACSI guide to small campsites, and recommended in the Caravan Club Caravan Europe guide. TV – no need to miss the big sporting events – Tour de France, Olympics etc. Dogs are welcome free of charge but must be kept on a lead at all times on the campsite. There are lovely walks in our adjacent fields and woods where dogs can be exercised off lead. You must clear up after your dog at all times. If you have any other requirements please ask and we’ll try our best to help.